Work together - even though you’re apart. Competing in today’s business environment requires agility — when meeting challenges, making decisions, and delivering products and services. With more than 115 years of excellence in both Information and Communications Technologies (ICT), NEC shares its vision through its award-winning communications technologies. A growing business innovates by leveraging the best and most current information technologies, tools, and products. NEC has created a full set of unified communications and collaboration applications that operate in conjunction with our telephony products, acting together as part of a fully converged easy-to-use IT solution. NEC’s experience and innovation enable new approaches to how IT services are managed and delivered. Cloud delivery, business agility, real-time collaboration, and reliance on assured services are becoming essential foundational requirements for the success of the smart and secure SMB or large enterprise. These pillars are part of a rapidly evolving technology foundation by means of which NEC is creating new ways for businesses to grow. Intelligent decision making starts with qualified information. The SV9100 comes with a simplified user-licensing structure and futureproof technology that meets the demands of your multi-generational employees. The SV9100 easily integrates with your existing NEC technology and is also capable of supporting future technologies. The UNIVERGE SV9100 Contact Center provides a detailed view of call activity of all agents — statistics can be used to reduce abandoned calls and follow up on missed calls. Callers are kept informed with periodic announcements. 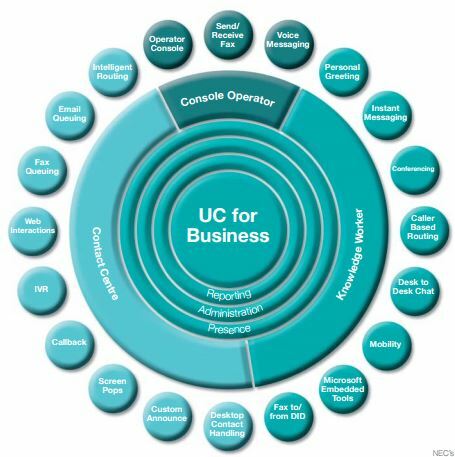 NEC’s UC Suite for SMBs delivers the tools that will increase performance throughout your organization. The UC Suite gives you and your employees access to the latest productivity-enhancing communications applications, such as user presence, instant messaging (IM), white boarding, application sharing, a multimedia softphone, and your UC client. With the SV9100 and its UC capabilities, your employees retain ownership of their communications. They set their schedule, and their phone rings accordingly. They launch a meeting or customer service session, and manage it directly from their UC Client. The SV9100 gives your employees exactly what they want—unencumbered communications tools that they control. Unify Your Communications, Messaging and Collaboration. Communication between you and your customers should never be difficult. Your customers expect to be able to get in touch with you easily. They don’t want long wait times, and they will demand smart contact capabilities. To be responsive to these needs, your employees must have tools at their disposal that help eliminate long call holds, incorrect call routing, and lost messages. Organizations need mobile applications that offer enhanced communications tools for on-the-go employees. The SV9100’s SMB mobility solutions allow users to set up their phones to ring the device of their choice. The phone is also set up according to pre-set rules that consider your current status/availability and who is trying to reach you. Regardless of where you are or who is calling, your office extension will always be your caller ID. And, with the addition of NEC’s Fixed Mobile Convergence solution, you can provide your employees with enhanced inbuilding and off-site coverage on mobile devices through your corporate Wi-Fi network. It doesn’t matter which mobile solution you choose, your employees will always remain in touch — on any and all Apple® or Android® smart devices — tablet or mobile phone — company provided or personal device — that they are using. • Multiple greetings based on time of day/night, day of week, holiday and incoming outside line. Confusion and agitation are a thing of the past with the simplified User License structure. NEC has streamlined and simplified its User License Structure. Our licensing structure gives both technology and financial decision makers the opportunity to anticipate user cost and the application access each user will receive based on the License Package purchased. The Standard License Package is designed for the regular UC user — the average employee who works in Finance, Marketing, Human Resources, etc. Each Standard user gets UC features, voicemail, and unified messaging, so he or she will be fully enabled to work anywhere, anytime, and from any device as needed. The Premium User License Package is designed for contact center agents or UC power users that also function as, attendants and operators. Each Premium user gets access to all the Standard UC features, as well as contact center, attendant, and CRM integration features — that will ultimately give them a more robust UC experience that easily ties into their daily business processes/business process technologies. Communications technologies should cater to your needs, not the other way around. NEC has a rich history providing communications solutions tailored for Hospitality, healthcare, Education, Retail, Government, Finance, Manufacturing and Transportation based organizations. If you’re looking for a communications solution that meets your industry’s individual needs, we’re the people to talk to. A hospitality environment presents the ultimate challenge for customer service employees, and the SV9100 caters to these needs perfectly. With the demand for a mobile, connected workforce growing in the Hospitality Industry; efficient communications are critical to maintaining high-quality guest services. With the SV9100, properties get access to robust hospitality centric offerings. Your staff will be able to be productive regardless of location within the property or off the property—resulting in increased responsiveness to guest needs. The SV9100 integrates seamlessly with many of the common PMS systems already deployed in hotels. Campuses are unique when it comes to communications. With the dispersed buildings, faculty and staff, and the increasingly mobile student population, the need for emergency communications, e-learning and robust communications technology that works in conjunction with multiple other technologies is becoming evident. The SV9100 is powerful and versatile enough to support all of a campus’s communications requirements. From unified communications that help increase efficiency and productivity, to contact center solutions for student services’ inbound calls, the SV9100 is the communications solution that your campus has been searching for. Communication technology stability is critical to patient health and safety in a doctor’s office. The SV9100 is a smart, secure investment for environments where privacy and responsiveness are of the utmost importance. Our Unified Communications enabled server is secure and safe, meaning that the physicians, nurses, and administrators in your facility can easily stay in contact with each other throughout the day, while patient information remains secure within the hospital’s local communications network. Also, missed appointments will become a thing of the past with the SV9100’s Appointment Reminder application. It enables you to send customized reminders and information to customers – reducing missed appointments and cancellations. 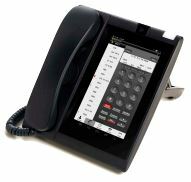 A premium desktop phone for every member of your organization. Running your business on an outdated system or forcing employees to use old devices that are ill equipped to handle their multi-faceted communications needs is bad for business. That’s why the UNIVERGE SV9100 platform supports the latest range of NEC desktop and mobile endpoints, including the DT800/DT400 series terminals, voice over WLAN and IP and Digitally Enhanced Cordless Telephone (DECT) mobile handsets. Customer service is the key to any business, and ensuring your customers speak with the right person is crucial. This is easy with the SV9100’s Contact Center applications. Boost customer service and agent productivity by routing calls based upon the number called, waiting times, and the time of day. Priority callers can jump the queue by dialing special queue numbers. Your customers are given the option of either leaving a message for agent call-back or holding for the next available agent. Callers are always kept in the loop with periodic announcements. Detailed reporting can be used for agent scheduling, business analysis and improving the efficiency of your contact center. These reports can be scheduled or printed on demand in both textual and graphical formats. Agents and supervisors are always informed with alerts sent directly to their desk phone. The SV9100’s real-time display provides a virtual wallboard directly to agent’s screens. Contact center applications can provide supervisors with both queue threshold and agent information on their PCs. Supervisors and authorized agents can also utilize an Agent desktop application to message important information to specific groups.